Ancestral Discoveries: Free New Jersey Maps! I have to admit — I've loved maps since I was a kid. I don't remember when I wasn't fascinated by them. When I was 14, I navigated my chaperone/driver on a Girl Scout trip through the "bad side" of Atlanta by reading the map after she got herself lost. I have a decent collection of modern and historic maps from various places in the U.S. and around the world. I'm sure most people know how useful maps are when doing family history research. They can help you locate a town, determine how close together two different towns are, pick out street addresses, maybe show you where the cemeteries are, depending on the map and amount of detail. Historic maps can have information about locations that no longer exist. So I was pretty happy to discover that the New Jersey Department of Transportation has posted online several county and state maps, absolutely free! There are detailed maps for each of the state's twenty-one counties; enlargements for large cities; maps showing railroads, the highway system, airports and heliports; congressional boundaries, legislative districts, and political subdivisions; and a statewide transportation map, both modern and the historic version from 1925. The county maps are modern and up-to-date but still informative. 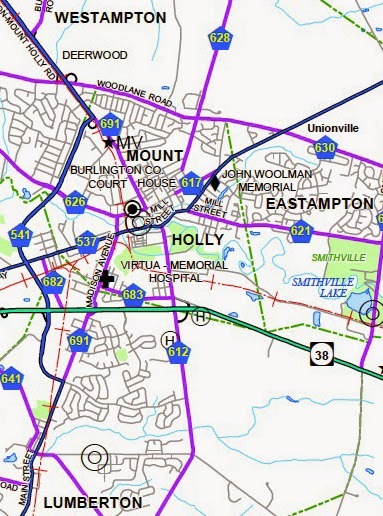 Looking at the Burlington County map, I see many town names associated with my family: Mount Holly, Eastampton, Northampton, Lumberton, Rancocas, Browns Mills. Fort Dix, where my grandfather worked for some time, is about 10 miles away from where he lived in Mount Holly. The map includes many local features, such as county courthouses, colleges and universities, correctional institutions, and hospitals. All the maps are available as free, downloadable PDF's. The sizes range from about 1 to 10 megs. Some maps can also be downloaded as KML format (for Google Earth) and Shape files (GIS vector format). The New Jersey state tourism site has the official DoT 2012 state map, also with lots of details. This file is 23 meg. So here's a hearty thank you to the state of New Jersey! I think I'll be wasti– . . . um, investing a lot of time looking at maps for a while. You had me at "free maps." I can think of a few reasons to have various maps of various time periods at my disposal. Do you know of any other states that are doing this...or who have done this sort of thing? This is the only one I've seen, but I haven't had time to look for more. As it was, I found this one accidentally; I wasn't looking for free New Jersey maps. But if you find any more, please let me know! Also check the website of your town of interest for property tax maps. If the town is a client of AppGeo or similar GIS vendors, you may find gorgeous PDF property tax maps which can be downloaded, plus a LOT of useful information, like when the buildings on the individuals parcels are built (useful for cross-checking with census addresses). Thanks for the links, Jan. I did know about the topo maps; they've bren available for a while. Fall Issue of "The Baobab Tree"